We have simplified the process to list your property or home. 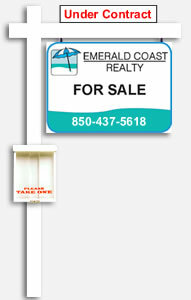 Emerald Coast Realty has the experience and knowledge as a Florida real estate brokerage to make your property selling experience as hassle free and smooth as possible. The first step of our Listing Strategy and most important to listing your property is to determine your home's current value. To determine the value a detailed real estate market price analysis also known as a Comparative Market Analysis (CMA) is performed. Using the pricing from the CMA, we will determine an asking price that is competitive with other properties in your particular area. We will conduct a public records search on your property once your information is received. We will contact you to confirm the accuracy of what you sent, then provide a CMA for you to review. Next we apply a Marketing Plan that details how we expose your property to as many local and out of state buyers as possible. My corporate marketing experience has been invaluable in this process. Get a quick and easy price estimate of what your property may sell. Ready to Start Your Free Detailed Market Analysis? A computer cannot give you an accurate home value but a qualified real estate professional can.